So who are the duo and magical minds behind ‘Saucebox’ cosmetics? This is what they have to say about themselves and their brand on their site . In the current paranoid, political and environmental climate on both sides of the Atlantic their ethos really appeals to me. Not only that but they are a Vegan & Cruelty free company (fellow animal lovers) and not crassly capitalist. As a pro artist I prefer fuss free, plain packaging, however it has a cute design and a mirror inside that certainly doesn’t offend. I do like that it is made of sturdy cardboard which means it’s light to travel with and recyclable. If the packaging isn’t for you then the pans are easily removed and can be placed in a Z or Mac palette. choice. No using a hairdryer and melting the glue! 4. They are good mix of cooler and warmer tones so will suit everyone. I love all the colours but the standout ones are ‘Cream Dream’ a great transition shade’ ‘Caramel’ a beautiful warm brown and ‘Toffee’ which is the blackest black. Applied with an eye primer and lasted throughout the day and an exercise class with no creasing, really impressed. Applies very easily, even the black which is a really dense opaque black-fabulous! It can be difficult to blend some blacks but this was no problem. They all work really well with shimmer and silk shadows and minimum fallout. A winner! I’m fickle about makeup products and like most pros are constantly buying and chucking, this is one that is going to stay in my kit for a long time. If you are looking for a great matte palette with lots of product for your money you will be really happy. The colours work well on eyes, brows and contour so you have a real multi-tasking palette here which is pretty amazing. 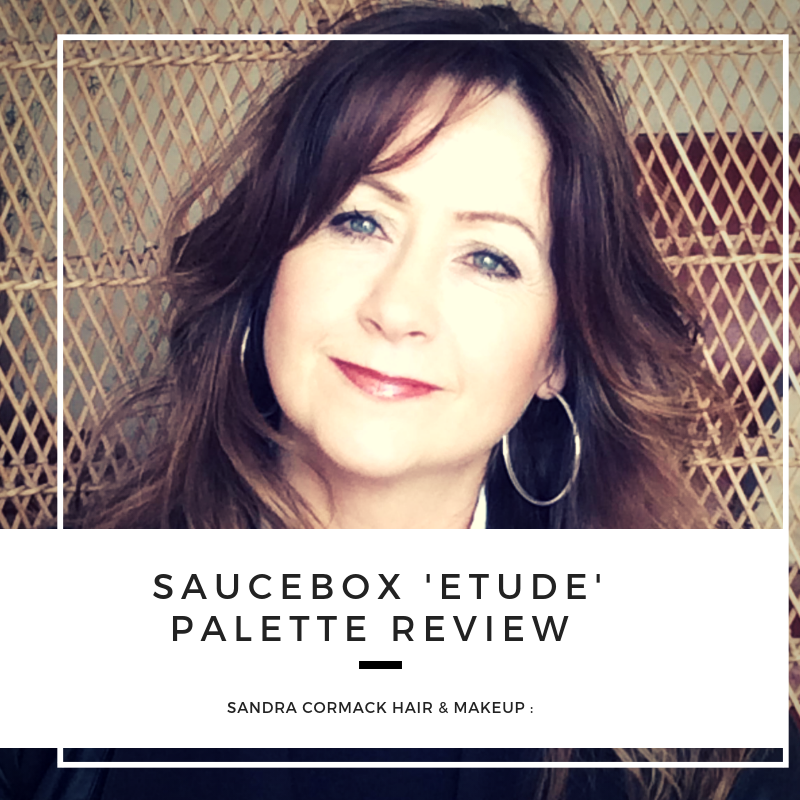 Well done Saucebox on a knockout palette, I love it! Check out ‘Saucebox’s other palettes , single shadows, brushes and their genius double-decker palette. It can hold up to 30 standard pans and of course I love the design colours ( black and gold) -my colours!